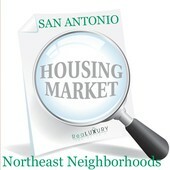 Here is Part 3 of the 2014 Fourth Quarter Housing Update -- this time focusing on San Antonio's northeast neighborhoods and beyond. Comparing data from January through December 2013 and January through December 2014, from the Texas Association of Realtors, here is a snapshot of what is happening in some of San Antonio's most sought after northeast neighborhoods. The median home price in Oakwell Farms rose from $320,000 to $351,000 with 46 homes sold in 2014. Homes for sale in Oakwell Farms were on the market 9 more days compared to last year. The housing inventory shrank from 8 months to 1.8 months. Click here to view all available homes for sale in Oakwell Farms. The median home price in Shavano Park decreased from $695,000 to $552,000, with 46 homes sold in 2014. Homes for sale in Shavano Park were on the market 38 fewer days compared to last year. The housing inventory in Shavano Park increased from 7 months to 37 months. Click here to view all available homes for sale in Shavano Park. The median home price in Encino Park increased from $208,250 to $215,000 with 52 homes sold in 2014. Homes for sale in Encino Park were on the market 1 day fewer compared to last year. The housing inventory decreased from 1.3 months to 1.2 months, indicating a continued, strong seller's market. Click here to see all available homes for sale in Encino Park. The median home price in Garden Ridge decreased from $441,500 to $430,000, with 47 homes sold year-to-date. Homes for sale in Garden Ridge were on the market 53 fewer days compared to last year. The housing inventory increased from 2.8 months to 9.3 months. Click here to see all available homes for sale in Garden Ridge. The median home price in Bulverde increased from $316,238 to $334,488 with 137 homes sold in 2014. Homes for sale in Bulverde were on the market 9 fewer days compared to last year. The housing inventory shrank from 8.3 months to 5.4 months. If you cannot wait to see your desired neighborhood listed in this post, please contact Jennifer Perloff for a detailed market analysis of any San Antonio or surrounding neighborhood. To get a complimentary analysis of your own home's market value, please contact Jennifer. Search For Homes On The Go! Works on any mobile phone.